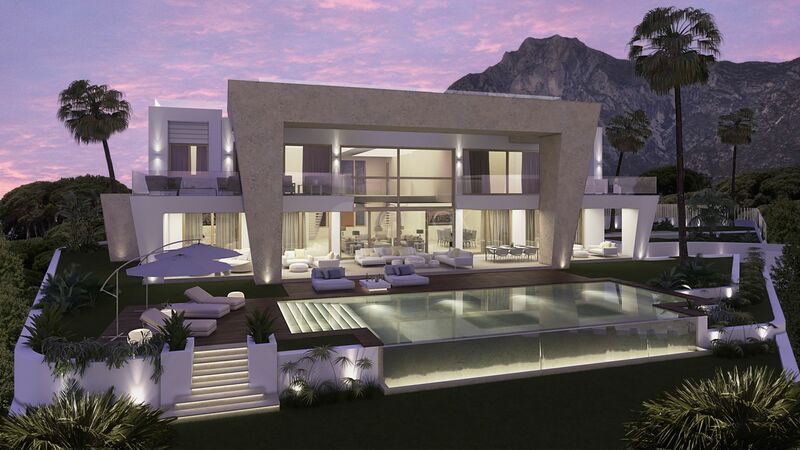 Stunning villa for sale, now under construction, in the exclusive residential area of Sierra Blanca, Marbella Golden Mile. The villa is on a plot in close proximity to the security guard house in Sierra Blanca. The elevated position of the corner plot allows privacy and guaranteed views in the future and enough separation to other plots across the streets making it stand free and far from most neighbors. Modern design architecture, imposing façade, high ceilings, rooms of large dimensions with floor to ceiling windows and doors. There is a lift, that gives access to all floors of the house including the solarium terrace. A large living room of 142 m2 offers three spacious areas, one with a design fireplace and library, a central area with spectacular double height, the south façade of glass opening to the almost 100 m2 covered terrace, and a third area for the dining table immediately next to the kitchen and with direct access to the terrace for enjoying outdoor meals. The villa will offer a fantastic SPA area with sauna and hammam rooms and heated indoor pool creating a special relaxation atmosphere. Luxury quality: special acoustic and thermal insulation achieved with Sismo building system , large scale porcelain floor tiles, underfloor heating , efficient air-conditioning system, domotic control system, pre-installation for jacuzzi on solarium terrace, bathrooms fitted with Villeroy & Boch sanitary ware and Dornbracht faucets, fully fitted kitchen by a leading designer, low-E double glazing with solar control, high performance aluminum joineries by Schüco. All this with the guarantee of expert architect and developer, in one of the best luxury location in Marbella. Please, send me more information about ref LUX0376 in Sierra Blanca, Marbella Golden Mile, Marbella or similar properties.